Limit dates to weekdays, weekends or any other group of days. Click the “All Days” option to reveal the specific days of the week. 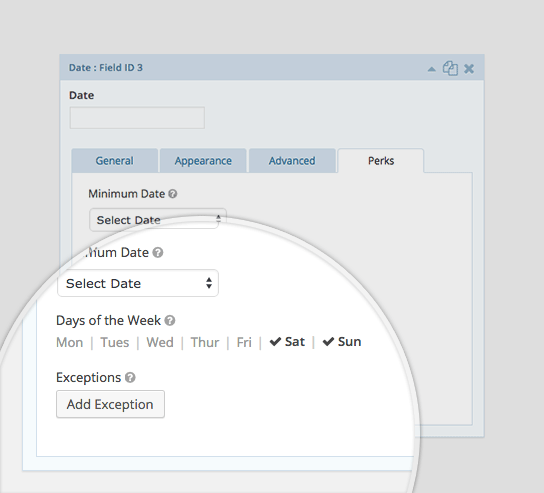 Select Monday through Friday to limit the selectable dates in this field to weekdays only. Click the “All Days” option to reveal the specific days of the week. Select Saturday and Sunday to limit the selectable dates to weekends only. I purchased last night! Woo hoo! I also copied that code snippet to the end of my functions.php file and I noticed right away that it has errors. The editor is telling me that (using your snippet line numbers) lines 1, 86 & 134 are in error. It’s colored them red. I tried leaving those lines as is and loaded the updated functions.php to my website and I couldn’t even launch the admin page. I reloaded the original functions.php and my admin page was back to normal. I then tried removing the 3 lines mentioned above and copied the updated functions.php back to my website. Same result as before – couldn’t launch my admin page. I put back the original functions.php and good again. But I’d really like the functionality that this code snippet is supposed to provide. Can you tell me if I’m doing something wrong? Can you answer a few pre-sale questions about the Date Modifier? When a customer fills out my form, I give them a 2-business day turnaround for what they’re purchasing from me (I’m using the WooCommerce Gravity Forms addon in my store). Does the Date Modifier (DM) arithmetic take the Days of the Week (DoW) into consideration? For instance, if I have my DoW set to M-F and a customer fills out my form on Thursday and I have the Minimum Date set to Current Date with a DM set to +2 days (I don’t know if this is available since I don’t yet own Gravity Perks) — will this Limit Date functionality correctly set the following Monday as the earliest date that can be selected? Can the DM be set (not displayed) conditionally? For instance, based on my example above, I offer a 1-business day turnaround for a project if the customer checks the box for the ‘1-business day completion’ add on for the product they buy. Using the example above, if the customer fills out the form on Thursday, can I set the DM to be Current Date +1 day meaning Friday would be the Minimum Date they could select? Likewise, if the customer fills out the form on Friday, then the Minimum Date they could select would be Monday? We have a copy-and-paste snippet that makes GP Limit Dates work this way. Just copy-and-paste into your theme’s functions.php and you’re good to go (once you’ve configured GP Limit Dates). 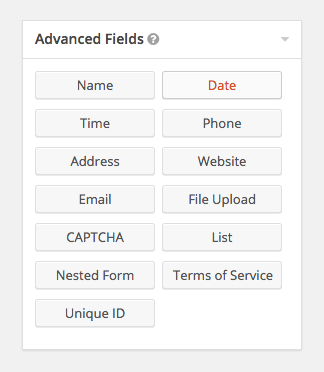 The modifier currently cannot be conditional; however, you can create multiple Date fields, each configured with a possible modifier, and show/hide each field based on the which option is checked so that only the appropriate date range is selectable. Excellent news, David. Thanks! I’ll purchase right away. Excited to have you as a Gravity Perks user! I’m needing to extend GP Limit Dates in this same manner (accounting for non-business days as part of minimum date) but the link above – https://gist.github.com/spivurno/85d1a9433af96667bd197332c98af042 – seems to no longer be valid. I scanned through your gists and just can’t seem to find the snippet anymore. Is this still doable? Thanks so much! how could I enable days to be only selectable based on a value. For example the customer can choose a flight from “Acme Industries”, and the dates available are only on Monday & Thursday. But if they choose say flight from somewhere else it shows only dates on a Tuesday. Currently I have this set up as 2 depart dates one for each destination and displayed on conditional logic – which causes lots of problems. This would require custom code to account for. The way you are handling it is the only way to do it out of the box. What kinds of issues are you running into? The dates are set as required/mandatory – when I submit the form it goes back to page where dates are located they become blank …… or there is a conflict with the hidden dates. And annoying the date picker is read-only and the date picker disappears. Could you point me in the direction of how to add custom code into it? I accept that this would be non-supported etc but would like to know how to add this functionality to this or other aspects of GF perks. 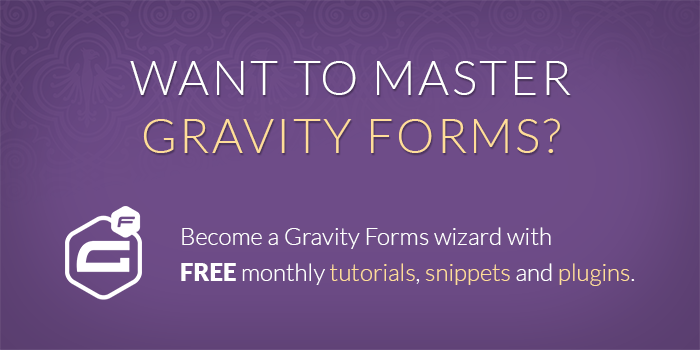 It’s the same one GP Limit Dates uses to integrate with Gravity Forms. You can use it to override GP Limit Dates integration as well. It sounds like the issues are you experiencing would be easier to solve than writing this custom functionality. If you want to send me a new ticket via the support form and include an export of your form with the date fields configured with this issue intact, I’ll be happy to take a look. Hi Natascha, we’ve fixed this issue. You should be good to go. Hi David, thanks. I was able to install it. But now the perk ‘GP Limit Dates’ requires GF 1.9.11.10. I have a running subscription so I update regularly and I am currently on version 1.9.11. Which is the most current one available in the download section (just checked on GF page). Hi Natascha, you should be seeing 1.9.11.14 on the download page. Could you check again? And sorry for the confusion, I should add a note to the documentation. 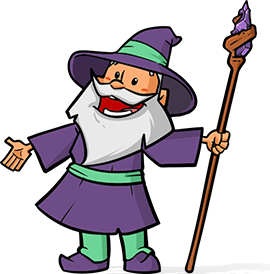 That would make Gravity Wiz’ Perks an option for all people who offer time slots, e.g. coaches, dog sitters, etc.